I really enjoyed this tenth mystery in the Mitchell and Markby series. It sees Meredith and Alan on holiday in a Cotswold cottage belonging to Alan’s sister, Laura and her husband in the village of Parsloe St John. 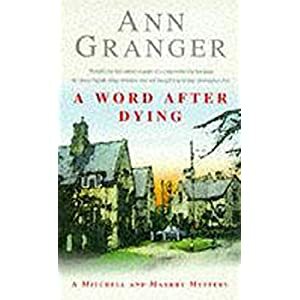 Their neighbour – Wynne Carter, a former journalist – is hospitable and talkative and the whole village seems welcoming. But Wynne is convinced that the recent death of recluse, Olivia Smeaton, is suspicious and wants Alan and Meredith to investigate it. Witchcraft, standing stones, some eccentric characters and some very odd episodes of vandalism precede the discovery of a gruesome murder and the police are called in. Alan, Wynne and Meredith must keep their own investigations low key to avoid getting in the way. The book is well written and I loved the small village background. I didn’t work out who the murderer was so it was quite a shock to find out. I had worked out what the background was to Olivia’ decision to shut herself away in her home and see as few people as possible but it didn’t spoil my enjoyment of the story. This is a series which really needs to be read in order of publication if the relationship between Meredith and Alan is to make sense. I am reading the series back to back and I am finding I am still enjoying it – which is always a good test of a series. If you like your crime novels written in a low key style with plenty of amusing moments and not too much graphic violence then this may be the series for you.